Feels like forever since I last posted here. Wait, it's been forever!What can I say..There was work, lots of it and at a fast pace, summer hang outs with friends and weekend discoveries around town. A trip to France that pumped all my energy and emotions and getting back in the groove of things which has been easier than anticipated. I am spending the weekend in a cabin in the northern Georgia with my bestie Tami from Running With Tweezers and I can tell Fall is right around the bend. I am a bridesmaid at her wedding and we decided to do a bachelorette weekend all together in a serene and peaceful house. The Appalachian mountains are quite lovely and tranquil during Fall. We are just spending a couple of quiet days catching up, genuinely talking about our hopes, fears, giving each others support and words of wisdom. Cooking, snacking, drinking wine and relaxing on the back porch doing nothing of extreme importance. A couple of days to read, relax and enjoy the sound of the river below. I needed it. On the weekend, easy peasy meals have been most welcome. The weather has been hot and humid, typically Southern and there has not been much time spent baking, roasting, braising, etc... I am looking forward to those days when Sundays turn into lamb roasts, onion soup and braised chicken. Until then, it's a loaded heirloom tomato salad, a minty quinoa and cucumber salad or better yet, a quick pasta dish with nothing else than a couple of add ons and a drizzle of olive oil. 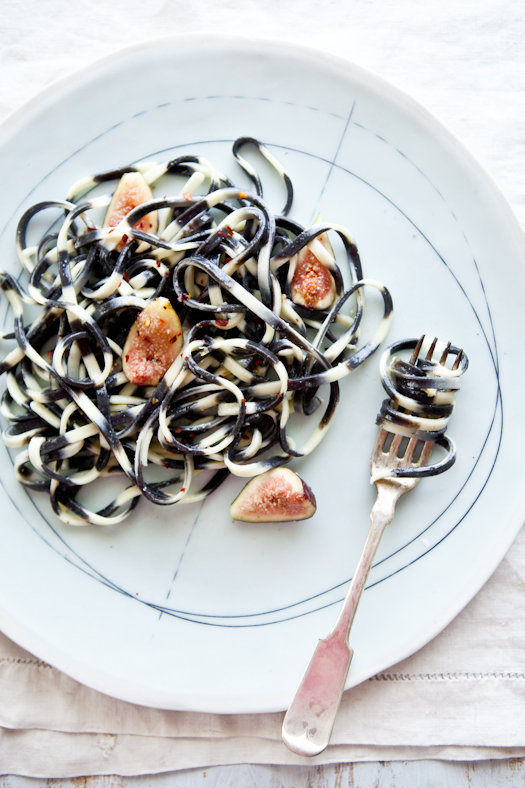 When in France, I picked up the coolest black and white spaghetti at a gourmet store. Striped squid in gluten free spaghetti. I feel like playing Mikado with my brothers again everytime I boil a handful. My to-go lunch one hot Saturday was a simple quick toss of said pasta with Stilton blue and fresh cut figs. A little olive oil and I was in business. Simple method, simple flavors. Cooking like we do in my family. A preview of Fall in a plate. Bring a large pot of salted water to a boil. Throw in the pasta and cook for 12 minutes. Drain and put into a large bowl. Drizzle a little olive oil (about 1 tablespoon) and toss. Add the crumbled blue cheese and figs. Season with salt and pepper. Drizzle a little more olive oil to taste. Hey welcome back, I've missed your posts and your pictures! Blue cheese is always my favorite ingredient to put in pasta, this recipe looks fantastic! Wow, the pasta is beautiful and the shots keep your eye engaged for such a long time. I bought your book recently, Helene, and I am consumed with it! As a beginner, there is so much to learn but I love every moment. Thanks so much. Nice to hear from you again! I am glad life is so full. And thank you for the beautiful photos. Truly inspiring. I've never seen such beautiful pasta before! Wow... This is the prettiest pasta I've ever seen. And most delicious looking! We've missed you on the blog! 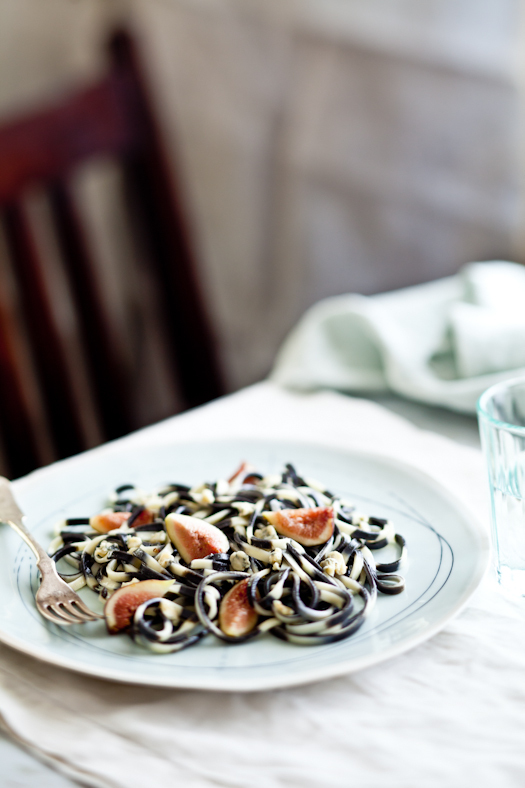 I adore squid ink pasta; there's a slight sweetness to it, which I'm sure pairs nicely with the figs. Yum! Love the "zebra" pasta look. 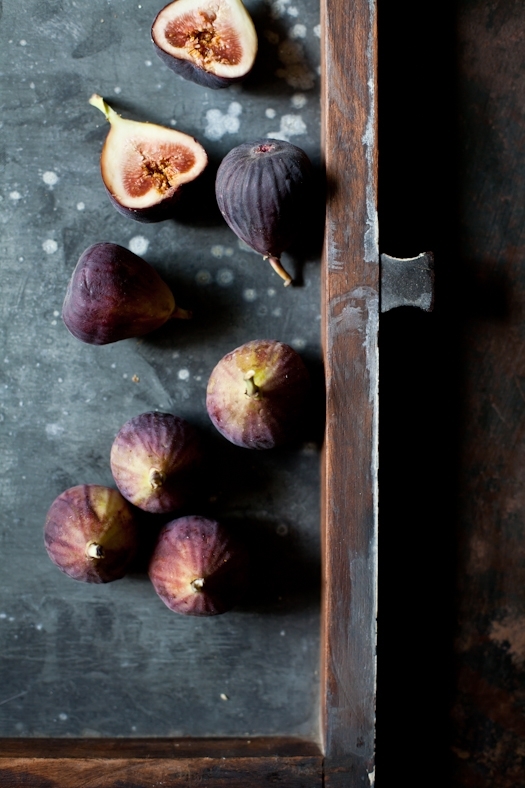 Beautiful contrast w the figs. So glad to have your inspiring dishes back! So glad your trip to France was a lovely one. Thank you for the gorgeous recipe! Much love to you! That is one of the most beautiful dishes I've ever seen! I love that it's so simple, with such elegant and unusual ingredients. I'm going to see if I can find some similar pasta here in the Seattle area and will try this out! Thanks for sharing. perfect flavor combo for a late summer dinner or lunch! Great to see such beautiful photos from you again. Welcome back! Awesome, I cannot wait to find this pasta! Oh you still take the most beautiful photos on the blog sphere. I am glad you have been busy, it means people treasure your talent! I recently purchased your book and it has heaped me greatly with my food blog photography. You are such an inspiration to me. 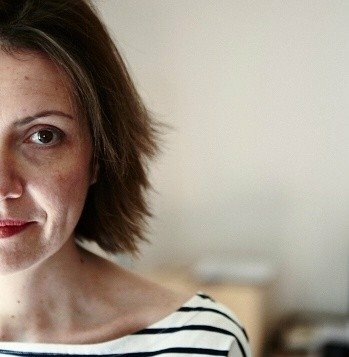 I hope you blog more, I really miss your recipes! Those colours in the pasta are just gorgeous and I do love a simple pasta dish, they're so comforting! I am wondering if we carry this colorful pasta here in the US this will look pretty on our table. I have to agree with Robin's post! This pasta is beautiful to gaze at - stunning photos of pasta!! Looks amazing! And can appreciate the simplicity of the recipe. Pasta looks preeti awesome and I think it taste really good with cheese. You have lost of tasty and healthy recipes in your blog, Thanks for sharing with us. 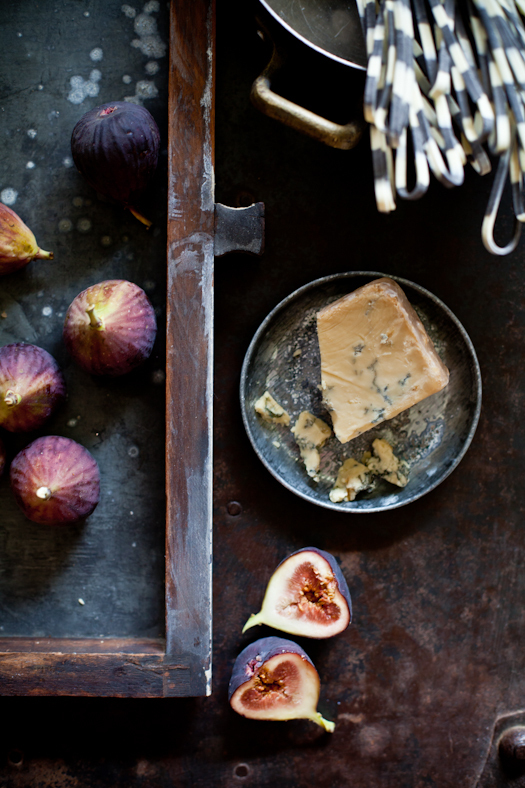 I love Figs and I also love Stilton Cheese, which is far and away the most popular blue cheese sold here in England. I really like your photographs too - beautiful. Fabulous photos! I love the fig and blue cheese combo. :) Very nicely done. 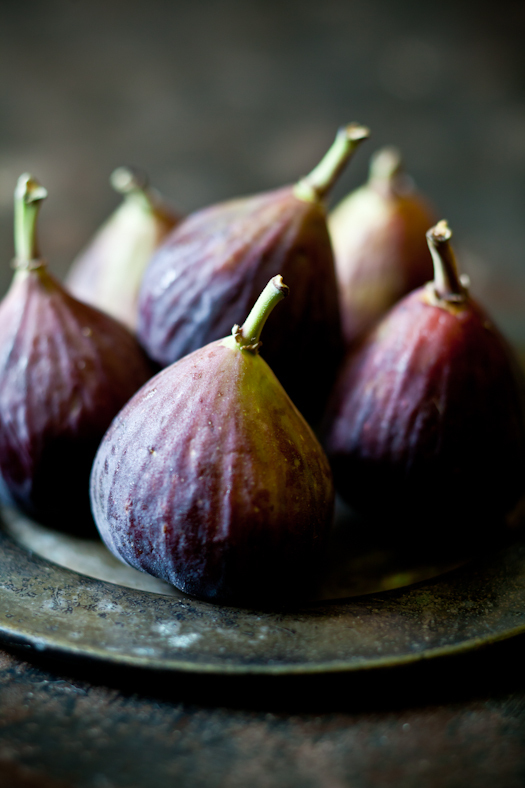 Would never have thought of thiscombination but it makes for a pretty spectacular looking dish...will try it next time figs are in season here. Grazie! Can you help me learn where to buy the pasta? Lauren Ashley: amazon.com is probably your best bet or a fine Italian gourmet store.